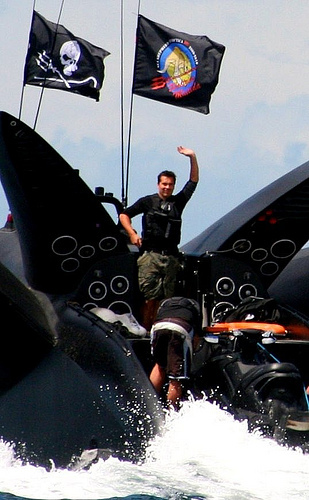 Only a few days after “The Cove” was awarded the Oscar as best documentary  drawing the attention of public and media around the world to the hunting of cetaceans issue, anti-whaling group Sea Shepherd’s leader Peter Bethune was arrested in Tokyo  [en], re-igniting the controversy between Japan and Australia – New Zealand. The protest group activist is charged with trespassing, for boarding a Japanese whaling ship in the Southern ocean during February while attempting to make a citizen’s arrest of its captain for the sinking of the Sea Shepherd’s ship one month earlier (as previously reported  for Global Voices by Kevin Rennie). Ady Gil. By Flickr id: james975. 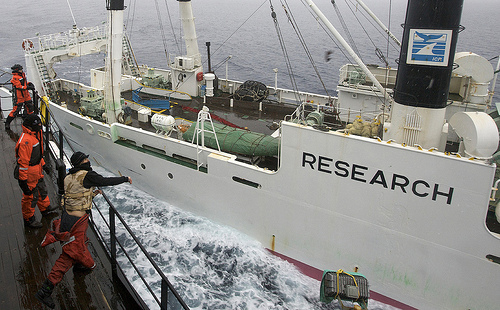 Although Japan’s whaling program  is only authorised for scientific purposes and most of the Japanese people do not regard whale meat their favourite meal, the collision with the New Zealand anti-whaling vessel has roused some sentiment of nationalism  [ja], though weak, in the country. But ‘jingoistic’ sentiments are also evident in the announcement of Peter Bethune’s arrest on the Sea Shepherd official website . The Japanese whaling ship Shonan Maru 2 arrived in Tokyo today with the first New Zealand prisoner of war to be transported to Japan as a political prisoner since World War II.As soon as his foot touched Japanese soil, Captain Bethune reestablished himself as a national hero in New Zealand and an international hero in Australia, France, Britain, the United States, and every other country whose citizens deplore the continued illegal whaling activities of the Japanese whaling fleet. In Japan, some feel New Zealand and Australia’s anti-whaling activity as an attack on their country’s food culture and wonder why whale meat should be prohibited while cattle and pig meat is not [ja]. It highlights the contentious divide between slaughtering debatably intelligent versus non intelligent animals. In some cases Japanese media increasingly rode the wave of polemic on the issue. James at Japan Probe  posts about Japanese broadcaster NTV’s show ‘Bankisha’ reporting on the Sea Shepherd issue. In the first part of the show he says, attention is paid to analyzing Sea Shepherd’s funding sources and budget. The second half of the clip is about Sea Shepherd’s next target: the bluefin tuna fishing in the Mediterranean. It looks like many countries have teamed up to ban the fishing of the species, and since 80% of the catch is sold on the Japanese market, it is being interpreted as yet another attack on Japan’s cultural traditions. Joining the reporters in the studio are an art director who does marketing for many of Japan’s famous brands and a legal scholar. The legal scholar points out how America used to kill whales for oil. He also thinks the American position towards Japanese whaling is influenced by an underlying hostility that the “white world” [白人社会] feels towards Japanese. The art director thinks that Japan needs to do a better job at presenting its case to the world, as so many people in other countries don’t understand why Japanese people eat whale meat. 2008-12-26 SS encounters Japanese whaling ship. By Flickr id:guano. Masablog however does not agree  with those who use food culture as a counter-argument deeming it as reductive. Previously, I had regarded this issue as having to do with anti-Japan sentiments, but that doesn't seem to be the case. As counter-argument, some Japanese wonder what the difference is between Americans eating beef [and Japanese eating whale]. Another one is that even if whales are protected, it’ll simply cause the number of cows to decrease. However, the real discussion seems to be humanitarian, regarding the fact that it takes more time to kill a whale. The issue is not about people being empathic with whales because of their high intellectual ability. Akki says  he condemns the methods used by the animalist group. I personally neither agree nor disagree with whaling. (I don't have the kind of money to eat whale meat, anyway.) However, their methods, no matter what the issue is, are simply troublesome and dangerous. What are they going to do if someone get hurt? 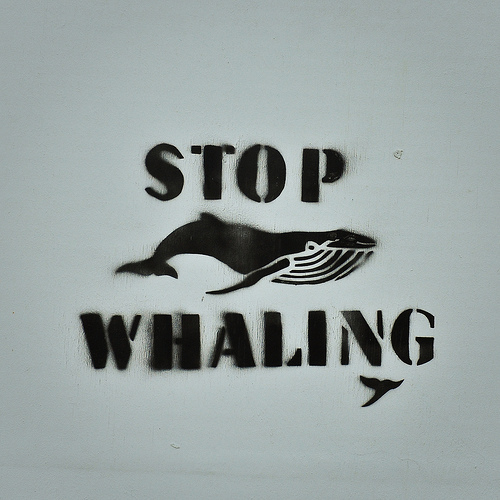 Stop Whaling. By Flickr id: alisonlongrigg. Australian blogger Youngmarxist  calls for an accurate revision of the IWC rules that would regulate whaling at international levels. If this plan ends the ridiculous hypocrisy that is “scientific” whaling, so much the better. There is no reason that whales should be treated any differently to any other resource. Whales should be managed properly, so they aren’t recklessly driven extinct, but there’s no good moral reason to privilege the “rights” of whales over the right of humans to hunt them.